Dwaine Wilson graduated from Idaho State where he payed college football and was signed as a free agent by Montreal in May, 1984. Wilson had an outstanding rookie season, rushing for 1083 yards and catching 58 passes for another 428 yards. For that performance, Wilson was named the top rookie in the East and named to both the Eastern and CFL All-Star teams. 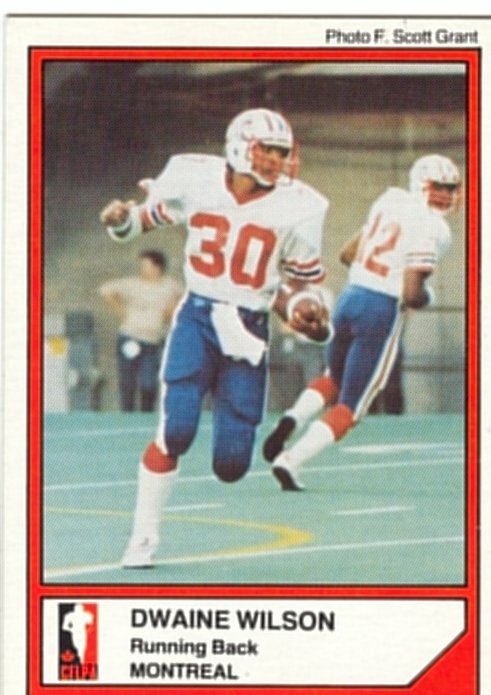 Wilson's rushing stats droped off to only 435 yards in 1985, though he did make 43 receptions in just 13 games. Dwaine Wilson drowned on April 12, 2008 at Elsinore Lake in California.